Amazingly yesterday evening about 6pm we heard bonobo screaming and chattering across the river as they settled in for the night. It was unreal. So of course this morning very early we crossed the river to search for them. Nothing. But then it got a little lighter and one of them took a piss. We found them. We followed the sound of piss falling through the leaves. Great sound. Then for about 15 minutes we had sporadic but clear sightings of them. I got a few photos; nothing really exciting. The forest is dark and they are against a light sky which makes it very hard to get a good photo. Good fun though. We are now camped in Obenge, the final final village. When we leave here it is at least five days south without a single settlement. And here in Obenge the villagers have not seen a white person since before independence (1960) so you can imagine I caused a lot of interest!! The last white person was looking for diamonds!!! Diamonds are going to be a real problem here. I have just done a 2 day short trip into the forest. Here are some notes, and a few notes from the short circuits that the other teams made as well. I am now waiting for both teams to come back from their longer 15 day explorations, one team is on each side of the Lomami. Seen more red tailed monkeys, black mangabey and red colobus. is where it is and never on the right bank, or Lualaba side. 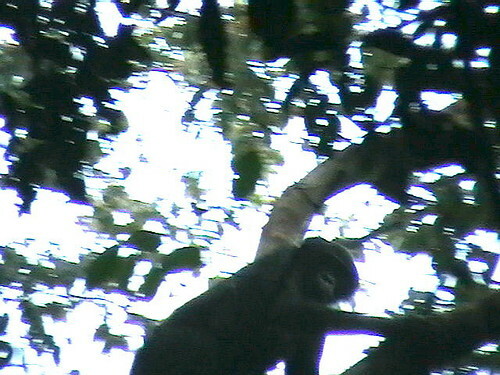 Have twice seen a monkey with a blue tail but cannot say much more than that as it always disappears quickly. That is on the east or Lualaba side. A few other people have seen it as well so it is not just me and local drink or a malaria delirium. recognised. Maga knows the monkeys in Salonga really well and did not recognize it at all. 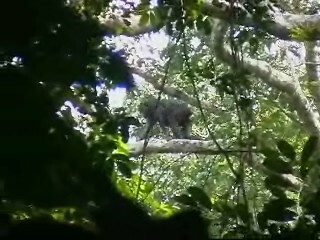 The local porter we had with us says they are common in the forest there. He described a distinct mask on its face so maybe it is Dent’s monkey. We obviously need to confirm this as Dent’s is certainly not expected here. Will go on another short trip into that area of forest to see what I can find. However monkey viewing will not be easy. They are all nervous at the first sound of people because of really heavy hunting around here. Have already seen a pirogue come back with a bushpig in it. All this village does is hunt: no fishing, no domestic animals. it goes from this river, Lomami, all the way to the Lualaba. Apparently full of elephants and buffalo. However with the amount of elephant poaching that seems to be going on, these have got to be very threatened. Anyway the swamp looks like an interesting area. All for now. Need a bath, going to jump in that giant brown water. 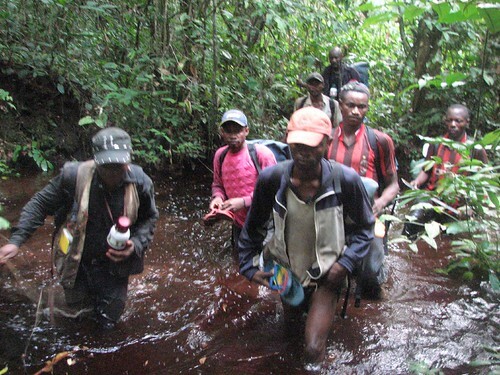 Maurice (on left) and his team in the swamp. Read more about the team members here. This entry was written by Terese Hart, posted on 2007-07-01 at 12:32 am, filed under Bonobo. Bookmark the permalink. Follow any comments here with the RSS feed for this post. Post a comment or leave a trackback: Trackback URL. I MUST go to Africa before I die. There are so many nooks and places to explore. Does the team stake their own tents or are there huts that you can sleep in for the night. Also, do the Bonobos build leaf-type nests like Chimpanzees and Orangutans do in the trees? Faye — THANK YOU. It is such an encouragement to receive a contribution. It really really is. As for nests. Yes, the bonobos build leaf based nests in trees and we camp on the ground in tents. You’re welcome Terese. I’ve been spreading the word about Wildlife Direct to everyone I know. Word is going around and I hope that more people are able to support the efforts of everyone who has a blog on Wildlife Direct. i saw the pictures of this strange monkey( “what is this?”). as the border for different species. be species poor, because of the absence of many species( okapi, chimps, gorillas, …). allways excited for the newest ones. Thanks Michael — Ashley reads all of these with a satellite connection but has limited time to answer…so mostly we take his letters and post them. He has just sent some really exciting ones and a really disturbing one — try to get it all on in the next few days. AND YEAH this is a real exciting area …. there is a mystery monkey that Ashley got three pictures of. It was in captivity in Opala. Primatiologists that we have shown it to can not agree as to what it is. That and new distributions! hi! thank you very much for creating this site! me and my friends are about to fly to congo, not D.R. of congo. We are wondering if there is any bonobos there. Also we are curius about their nutrition, would like to know what fruits are they eating, for we know they are frugivores, right? Maybe this is the begining of a very long chat, we are looking to buy land and start a natural fruitarian community as close to our natural habitat, wich is equatorial! so congo is our first destination, but we will go anywhere that is fit.